Well Royals, it’s that time of year again. 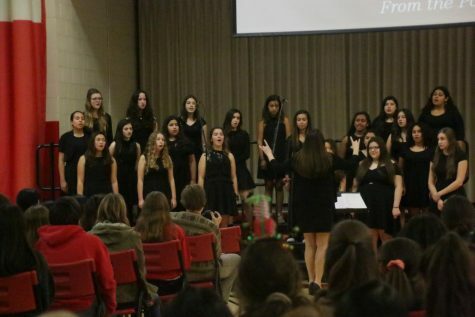 Last Friday, January 25, marked the start of Rosary Academy’s most cherished tradition: Red and Gold. Captains put hours and hours of work over the last month painting posters, writing scripts, choreographing dances, designing costumes, and so much more. Red Captains enjoying breakfast before Kickoff. Photo by Mrs. Reinbold. On Friday morning at 6 a.m., all this work paid off as 80+ captains sprinted as fast as they could to flood the school with as much red and gold as possible. When the rest of the student body arrived that morning, it was hard to find a spot on campus that wasn’t filled with red or gold. Red and Gold Kickoff is the day that everyone (besides captains) finds out what category and team they’re on. They also reveal the theme and mascots. This year, the theme for the season is “in between the lines” and the mascots are the Red Composers and the Gold Animators. Royals of all grade levels are extremely excited for the next six weeks of preparation for the big show. A few Royals were able to share their thoughts and opinions on the day and time ahead. Senior Anielka Ruiz is on Gold drill. She says, “I am excited to work with and get to know people I didn’t really know before.” A big part of Red and Gold is getting the opportunity to do just that. It is Anielka’s last Red and Gold, and it is a wonderful chance for her to meet other’s that she may have never gotten the chance to know before she graduates with the rest of her class in June. Gold Captains enjoying breakfast before kickoff. Photo by Mrs. Reinbold. Red Food Banner. Photo by Mrs. Reinbold. Gold Banner. Photo by Mrs. Reinbold. It is very clear that the Rosary community is very excited for the next six weeks as they prepare for Red and Gold. Shows are March 8th and 9th, so make sure to tell your friends and family!